Sarah is a graduate of University College London where she gained a BA (Geography) in 1981; an M.Phil. (Town Planning) in 1983 and, after a stint working for the Greater London Council, a PhD (Geography) in 1988. She spent 12 years teaching in the School of Geographical Sciences at the University of Bristol, where she was promoted to a Chair in Human Geography in 1999 and awarded a DSc for published research in 2000. 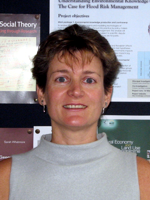 She moved to the Geography Discipline at the Open University in September 2001 as Professor of Environmental Geography. Sarah has also held visiting appointments in several institutions overseas including the University of California, Santa Cruz and the University of Wisconsin, Madison (USA); the University of Newcastle, (Australia); and the University of Trondheim (Norway). A Fellow of the Royal Geographical Society (with the Institute of British Geographers) for nearly 20 years, Sarah was elected to the Council of the RGS/IBG and to membership of the Research Committee in June 2004 for 3 years. She is also an elected member of the Academy of Learned Societies in the Social Sciences and a Fellow of the RSA (Royal Society for the encouragement of Arts, Manufactures and Commerce). She is currently an editor of Environment and Planning, A (Pion) and of the Blackwell Dictionary of Human Geography (5th edition), and serves on the editorial boards of several journals. Her research focuses on relations between people and the material world, particularly the living world, and the spatial habits of thought that inform the ways in which these relations are imagined and practiced in the conduct of science, governance and everyday life. She has published widely on the theoretical and political implications of these questions in two main directions.